The Canadian coyote (canis latrans Say) lives in the northern regions of Canada, Alaska and in Central America. Coyotes have a reddish-yellowish-gray color and very full, dense and soft hair. Like many other predators, the coyote has just a few natural enemies. To prevent overpopulation, professional hunters control the coyote population. One of our most important objectives is to make sustainable use of existing resources and reconcile them with nature. We support the regulated hunting by using Canadian wild animals for our fur products. If you decide to buy a product from Canadian coyotes, you can be sure to get an excellent natural fur product from controlled hunting. We produce coyotes blankets, coyote fur cushions, and accessories. If you have any questions or requests, please do not hesitate to contact us. 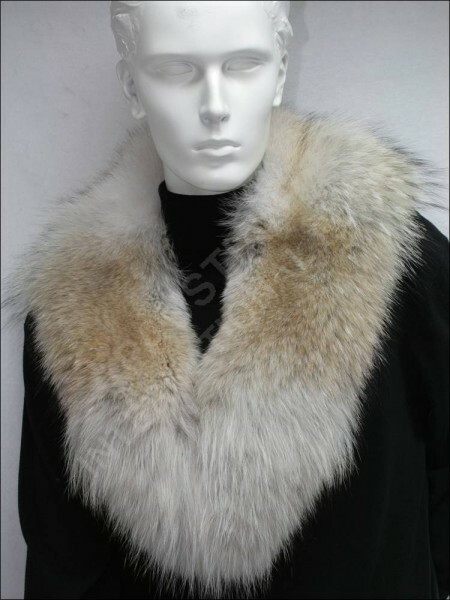 Related links to "Fur collar made from coyote furs"
Customer reviews for "Fur collar made from coyote furs"